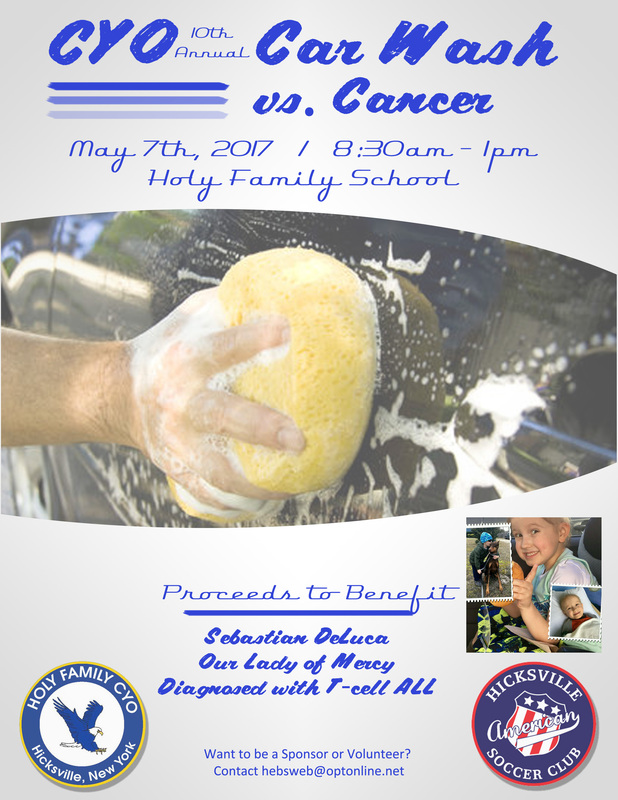 On Sunday, May 7 (rain date May 21), Holy Family CYO will host its 10th annual Car Wash vs. Cancer. The car wash will be held at Holy Family School from 830am-1pm. Proceeds from the car wash will be donated to Sebastian DeLuca's parents to help defray Sebastian's medical expenses. Sebastian (see attached photos) is a 5 year old kindergartner at Our Lady of Mercy School in Hicksville. On December 13, 2016, Sebastian was diagnosed with T-cell A.L.L. leukemia. He is currently receiving chemotherapy and other treatment at the Cancer Center for Kids at Winthrop Hospital. When Sebastian was 8 months old his mother was diagnosed with Diffused Large B-Cell Lymphoma. Fortunately, she is currently in remission. If you want to show your support for the DeLuca family you can attend the car wash, volunteer to wash cars or make a donation. Checks should be made payable to Anthony DeLuca and mailed to Ed Hebron at 2 Mitchell Ct. Hicksville NY 11801. Each year the number of cars to be washed increases so we need to increase the number of volunteers. Even if you can only help out for an hour we welcome your service. Please rsvp if you can assist us. The Hicksville American Soccer Club Board of Directors would like our club members to participate. We would like players and parents to volunteer for this worthy cause. This is a great opportunity for older players to earn community service hours. It is also a great team building exercise. Please let me know that we can count on your support by replying that you will be there to help. Lets show our community that we appreciate all the support that they show us. Hicksville Soccer Club Board of Directors.